Processing and enrichment using a proprietary combination of algorithms pre-trained for sensitive information detection and extraction. Emergent's proprietary processing and detection goes well beyond the capabilities of regular expressions. 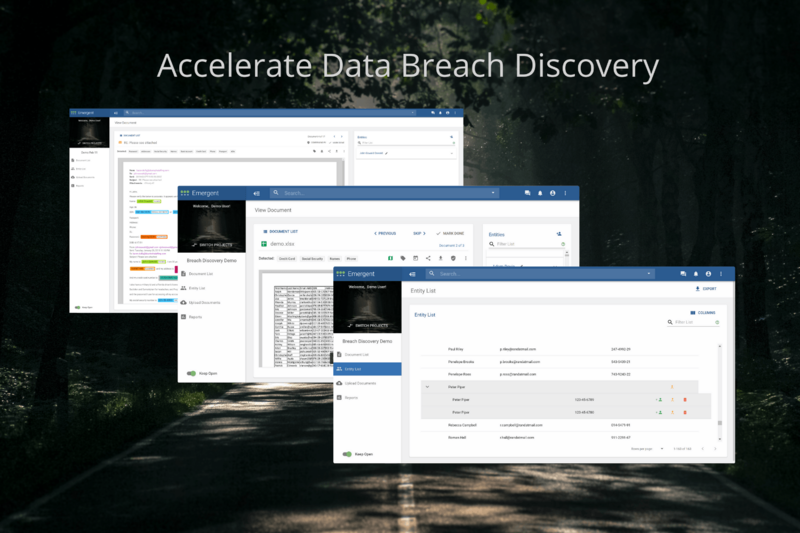 Analytics designed to measure the impact of the breach, cull documents, and organize documents to convert to a list of Data Subjects. Emergent can assess the confidential personal data impact of the breach prior to conducting the review. Coding technology and workflow designed to resolve the many-to-one relationships between Data Subjects and their personal data found across multiple documents. Emergent provides the ability to quickly extract, resolve, and export a list of unique Data Subjects. When a data breach occurs, time is of the essence. Combing through millions of documents to determine if confidential personal data has been breached requires a new approach. Emergent's technology was designed specifically for this task. Canopy's Data Breach Review provides rapid discovery through smart information detection technology and specialized workflows for incident response teams who need to generate a list of affected individuals.